, one of the most learned men of the sixteenth century, was born at Dundee in Scotland, in 1506, and after making great progress in the Greek and Latin languages at the grammar school of that place, studied philosophy at St. Andrew’s university with equal success* He afterwards studied civil law at Paris and Bourges. At this latter city he became acquainted with the Greek professor, James Amiot, who recommended him to be tutor to two young gentlemen; and this served also to introduce him to Bernard Bornetel, bishop of Rennes, a celebrated political character, who invited Mr. Scrimzeor to accompany him to Italy. There he became acquainted with the most distinguished scholars of the country. 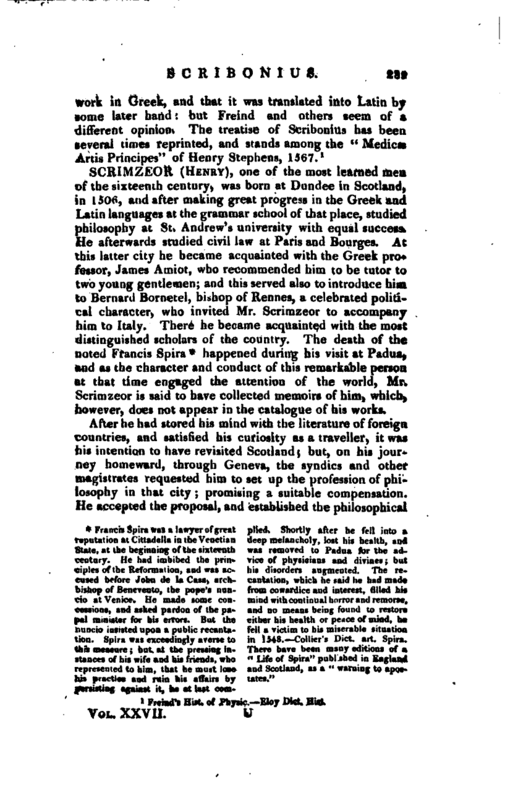 The death of the noted Francis Spira * happened during his visit at Padua, and as the character and conduct of this remarkable person at that time engaged the attention of the world, Mr. Scrimzeor is said to have collected memoirs of him, which, however, does not appear in the catalogue of his works. * Francis Spira was a lawyer of great plied. Shortly after he fell into * reputation at Cittadella in the Venetian deep melancholy, lost his health, and State, at the beginning of the sixteenth was removed to Padua for the adcentury. He had imbibed the prin- vice of physicians and divines but ciples of 'he Reformation, and was ac- his disorders augmented. The recused before John de la Casa, arch- cantation, which he said he had made bishop of Benevento, the pope’s nun- from cowardice and interest, filled his cio at Venice. He made some con- mind with continual horror and remorse, cessions, and asked pardon of the pa- and no means being found to restore pal minister for hi* errors. But the either his health or peace of mind, be nuncio insisted upon a public recanta- fell a victim to his miserable situation tion. Spira was exceedingly averse to in 1548. Collier’s Diet. art. Spira. this measure but at the pressing in- There have been many editions of a stances of his wife and his friends, who “Life of Spira” published in England represented to him, that tie must lose and Scotland, as a “warning to aposhis practice and ruin his affairs by tales.” persisting against it, he at last | comchair; but after he had taught for some time at Geneva, a fire broke out in his neighbourhood, by. which his house was consumed, and he himself reduced to great distress. At this time flourished at Augsburg that famous mercantile family, the. Fuggers. Ulric Fugger, its then representative, a man possessed of prodigious wealth, and a munificent patron of learned men, having heard of the misfortune which had befallen Mr. Scrimzeor, immediately sent him a pressing invitation to accept an asylum beneath his roof till his affairs could be re-established. Mr. Scrimzeor, gladly availing himself of such a hospitable kindness, lost no time in going to Germany. Whilst residing at Augsburg with Mr. Fugger, he was much employed in augmenting his patron’s library by vast collections, purchased from every corner of Europe, particularly manuscripts of the Greek and Latin authors. He also composed many works of great learning- and ingenuity, whilst he continued in a situation so peculiarly agreeable to the views and habits of a scholar; and when he was desirous of returning to Geneva to print them, Fugger recommended him, for this purpose, to the very learned Henry Stephens, one of his pensioners. Immediately on his arrival at Geneva, 1563, he was earnestly solicited by the magistrates to resume the chair of philosophy. With this he complied, and notwithstanding the dedication of much of his time to the study of physics, he, two years afterwards, instituted a course of lectures in the civil law,and had the honour of being its first professor at Geneva. Being now settled here, he intended to have printed his various works, but a suspicion which Henry Stephens entertained, that it was his intention to set up a rival press at Geneva, occasioned great dissentions between them. 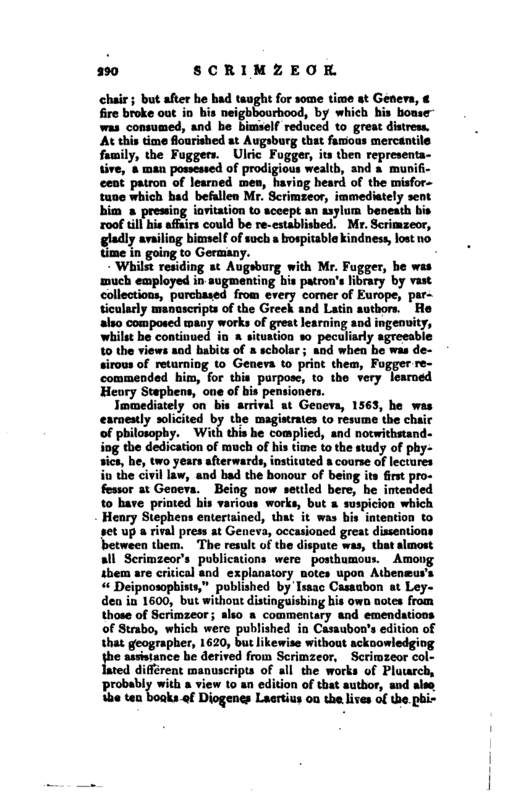 The result of the dispute was, that almost all Scrimzeor’s publications were posthumous-. Among them are critical and explanatory notes upon Athenaeus’s “Deipnosophists,” published by Isaac Casaubon at Leyden in 1600, but without distinguishing his own notes from those of Scrimzeor; also a commentary and emendations of Strabo, which were published in Casaubon’s edition of that geographer, 1620, but likewise without acknowledging the assistance he derived from Scrimzeor. Scrimzeor collated different manuscripts of all the works of Plutarch, probably with a view to an edition of that author, and also the ten books of Piogenes Laertius on the lives of the | philosophers. His corrected text of this author, with notes full of erudition, came into Casaubon’s possession, and is supposed to have contributed much to the value of his edition of Laertius, printed at Paris in 1593. The works of Phornutus and Palsephatus were also among the collations of Mr. Scrimzeor. To the latter of these authors he made such considerable additions that the work became partly his own. Tht: manuscripts of both these were for some time preserved in the library of sir Peter Young, after that of his uncle Scrimzeor, which was brought into Scot-, laud in 1573, had been added to it. What became of this valuable bequest at the death of the former, is not known. 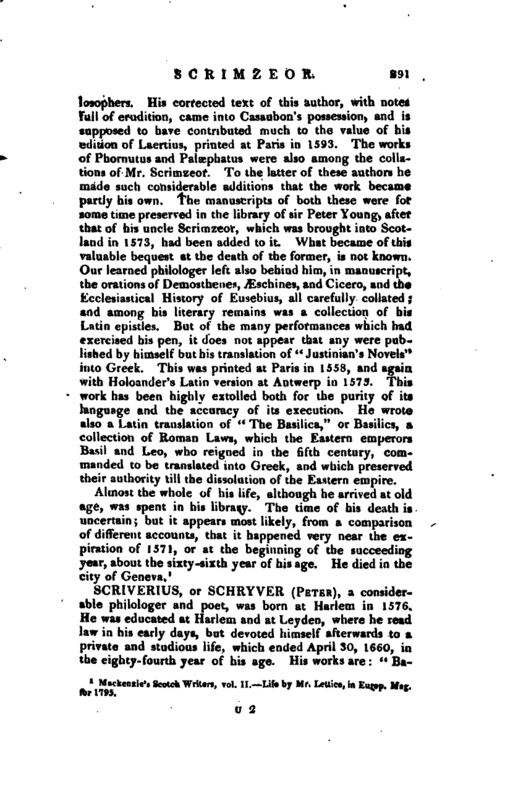 Our learned philologer left also behind him, in manuscript, the orations of Demosthenes, Æschines, and Cicero, and the Ecclesiastical History of Eusebius, all carefully collated; and among his literary remains was a collection of his Latin epistles. But of the many performances which had exercised his pen, it does not appear that any were published by himself but his translation of “Justinian’s Novels” into Greek. This was printed at Paris in 1558, and again with Holoander’s Latin version at Antwerp in 1575. This work has been highly extolled both for the purity of its language and the accuracy of its execution. He wrote also a Latin translation of “The Basilica,” or Basilics, a collection of Roman Laws, which the Eastern emperors Basil and Leo, who reigned in the fifth century, commanded to be translated into Greek, and which preserved their authority till the dissolution of the Eastern empire. Mackenzie’s Scotch Writers, vol. II. Life by Mr. tettice, in Europ.